Home / Le blog / The angelica of Niort-Marais Poitou, an explosive party for papillae! 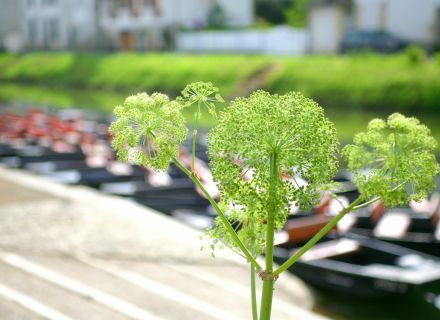 The angelica of Niort-Marais Poitou, an explosive party for papillae! 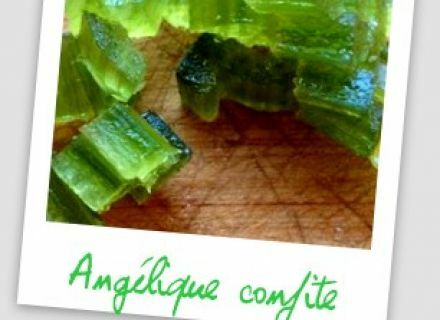 Let us dip straight out our finger into the jar of Marie-France Thiery's angelica which proposes us a recipe house extracted from its blog " A spoonful for dad ": small jars of cream in the crystallized angelica and in the almonds.
" The angelica, a name suggestive of sweetness. The sweetness of the desserts of my childhood. You know, delicious cakes filled with small dice of candied fruits of all the colors: orange, red, yellow, green... A biscuit everything in simplicity to accompany the coffee in the break of environment of the afternoon or in the breakfast. In these candied fruits, there was an angelica in the recognizable flavor between all, but so difficult to explain: a mixture of just a little prickly bitterness and sweetness. Until a friend gives me one foot of his garden, I knew of the angelica only these small dice about the attractive translucent green color. I then discovered the plant, looking like strangely the rhubarb, but o how much different in its flavors! I learnt at the same time that everything could consume in the angelica. Sheets can enter the preparation of small crunchy doughnuts with a dough for tempura salted, at the time of the apéritif; in a salad, on a fish, chiselled to bring a little flavor as a classic grass, it is great also. With fruits and seeds, we realize a delicious liqueur which can serve possibly to perfume a small whipped cream. Then the stalks which we can fry simply as a usual side dish for a meat course or a fish or then chisel and cook in frost or jam. For this first use, I prepared a cream with small dice of crystallized stalks. 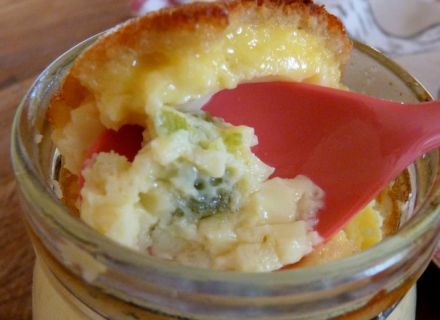 In attractive jars in the former, it is the very simple dessert which delighted all the family ". For the crystallized angelica: 2 stalks of angelica - 250 g of sugar / 1/2 liter of water. With a knife, remove all the fibers of stalks, as for the rhubarb. Put down stalks in a pan, fill with cold water and bring to a boil. Put out the fire, drain and begin again the operation second time. Drain again. Pay the half-liter of water and the sugar. Bring to a boil, and add the stalks of angelica. Lower the fire and let candy - on the softest possible fire - during two hours. After cooking, you just have to let dry on a baking paper or a railing and then cut stalks in small sections or small dice, as you prefer. Bring the milk to a boil. Break eggs in a salad bowl, pay the sugar and whip every during one minute. Incorporate the hot milk, gradually, by continuing to mix regularly. Add the powder of almond and the sticks of crystallized angelica. Distribute the preparation in jars. Arrange jars in the dripping-pan or a big hollow dish. Fill with water in three-quarters. Put in the oven - thermostat 190 ° - in oven preheated during 45 minutes. For the technique of confisage, I trusted leader's recipe Simon. Our blogger has just opened you the appetite? 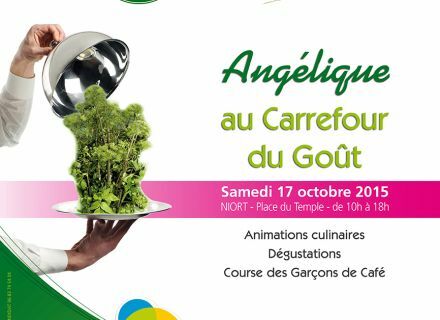 Go out at the moment of your kitchen to go off to explore Angélique au Carrefour du Goût which will be held in Niort, Saturday, October 17th. Within the framework of the Semaine du Goût, the association of promotion of the angelica Niort-Marais Poitou and the Carrefour des métiers de bouche invites you in this gastronomic meeting local 100 % which will be held under the shape of a culinary village with dedicated spaces (cooking, tasting and sale). - A festive evening on Friday, October 16th, on the esplanade of the Breach (tales and culinary bed songs, " big greedy meal ", paraded fur hats, aprons and accessories of cooking). - On Saturday, October 17th, a market farmer, place of the Temple, in the presence of dietitians and an animated market, in the Les Halles which are transformed for the opportunity in the kitchen huge. 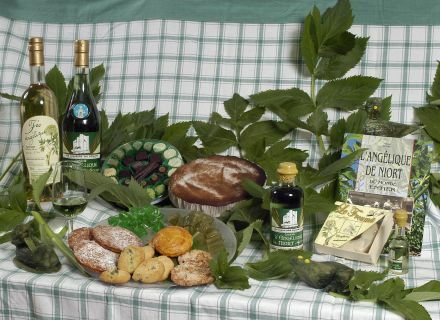 - Until Sunday, October 18th, restorers will propose menus specially developed for the event (The Resto, the Campanile).